In the late '60's Elliott was the house drummer at Earl Dixon's infamous Hillbilly Heaven nightclub. In April 1972, when his talents were noticed by Billy Hancock and Danny Gatton, Elliott was asked to join their new act. Elliott agreed and Danny and the Fat Boys were born. The trio stayed together for much of the '70's playing clubs, traveling, and recording. Elliott continued playing with the bands of Danny Gatton until 1990, having achieved many successes in his 18-year career with Danny. 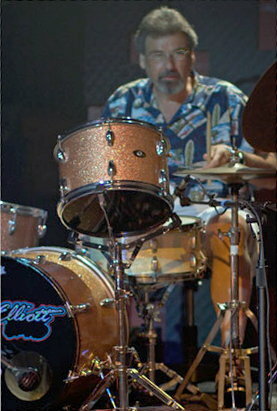 Elliott also has been associated with the bands of Les Paul, Hot Tuna, Bill Kirchen, Johnny Seaton, and Billy Hancock. Elliott's drum style is best described as effortless. He can swing like a well-oiled gate, and his inimitable off-beat hi-hat cymbal has eaned the respect of drum giants Jim Keltner (The Traveling Wilburys, Little Village, etc. ), Max Weinberg (Bruce Springsteen, Conan O'Brien), Omar Hakim (Saturday Night Live). He can be heard currently on Little Bitta Love.